Clastic sedimentary rocks are a common type of rock formed from a mix of softer sediments and pieces (clasts) of pre-existing rocks. 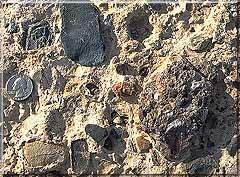 Pieces of rock are loosened by weathering, then transported to some basin or depression where sediment is trapped. If the sediment is buried deeply, it becomes compacted and cemented, forming sedimentary rock. Clastic sedimentary rocks may have particles ranging in size from microscopic clay to huge boulders. Their names are based on their clast or grain size. The smallest grains are called clay, then silt, then sand. Grains larger that 2 millimeters are called pebbles. Shale is a rock made mostly of clay, siltstone is made up of silt-sized grains, sandstone is made of sand-sized clasts, and conglomerate is made of pebbles surrounded by a matrix of sand or mud. This page was last modified on 2 May 2008, at 13:33.